These strong, arched hardwood hangers feature a space-saving flat body, two carefully crafted notches for the option of hanging straps, and a polished chrome swivel hook. Kid-friendly features include rounded edges which prevent pucker marks in tiny garments and double coating of lacquer to prevent splintering. 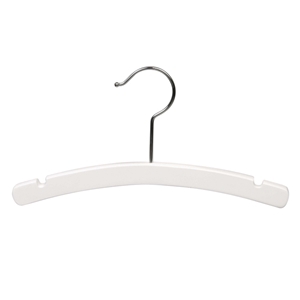 These high quality, low cost hangers are manufactured to last a lifetime.